Intestinal diseases are a significant health issue worldwide, with varying causative infections resulting in symptoms that range from mild or asymptomatic to death within hours. Understanding the cause of the different forms of intestinal disease is a critical aspect of proper management of these diseases that can save lives. 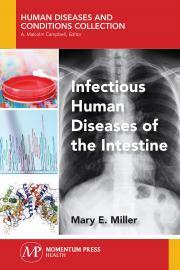 This book describes the current understanding of symptoms, diagnosis, mode of transmission, and treatments of four important intestinal diseases, taking into consideration the molecular interactions between host cells and infectious agents. Specifically, dysentery caused by infection with Entamoeba histolytica, giardiasis caused by infection with Giardia, shigellosis caused by infection with Shigella, and cholera caused by infection with Vibrio cholera, are discussed in each chapter. The author also discusses future work related to prevention and treatment of these critical infectious diseases, given that the eradication of these diseases is unlikely. Awareness of how these diseases are spread and how they can be contained is a growing public health concern, particularly after natural and human-made disasters where public hygiene may be compromised. Mary E. Miller is a professor of biology at Rhodes College, Tennessee, where she teaches introductory biology, genetics, molecular biology, microbiology, and topical seminars on cancer and has served as the director of the biochemistry and molecular biology program. Dr. Miller studies cell division and key regulators of the cell division cycle and has been awarded the Rhodes College Clarence Day Award for Outstanding Research or Creative Activity.